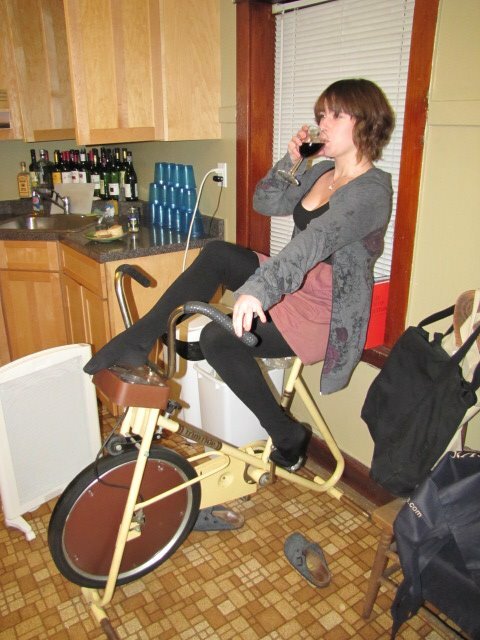 This is a picture of me being a modern young lady by drinking wine on a vintage exercise bike. I am a modern young woman. I think. I am practical. I pick most of my clothes based on how easily I can move in them, which has gradually devolved into never wearing pants. (Ever. Seriously, leggings and ambiguous long top/dresses forever.) I put my money where my mouth is when it comes to feminism, quite literally, in the sense that I won’t let a guy pay for my dinner. Unless I’m paying next time. I am confident. I have the audacity to actually like my body, even though I don’t have a flat stomach and my thighs are kind of massive. I don’t obsessively shave bits of myself that don’t really need shaving. (I mean, honestly, it’s WINTER.) My body occasionally makes strange noises and odours and I don’t apologise for that. I can hold my own. I can take a joke. I have my own goals and ambitions and plans, and none of them involve getting married any time soon. Or indeed, maybe ever. So this is what I’m like. While I can’t imagine myself being any other way, part of me knows that, at some point, it was a conscious decision. At some point, probably when I was around 14 or 15, I made a value judgement; I didn’t want to be that girl.